It rained a bit last night but when I woke up it was nice and dry. But the blue sky from yesterday had been replaced by heavy grey clouds. I was back on the road at around 7.30am. It was about 60kms to Goulburn. The scenery was a mixture of farms and bushland through rolling hills. Saw a number of kangaroos with joeys, but each time I got my camera out they hoped away! With the cloud cover, it kept the temperature down. Plus I had a slight tailwind, so got to Goulburn at around 10.30am. 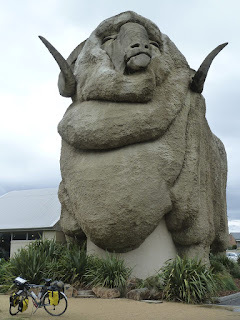 Goulburn is situated about 200kms south of Sydney on the Hume Hwy. It is the main town in the region and is famous for the giant Merrino sheep. So I stopped there for the photo shot and you can even climb up to it's head for a view. That is the main highlight in Goulburn. After I got over my excitement at the giant sheep, I went to the camp site just down the road. 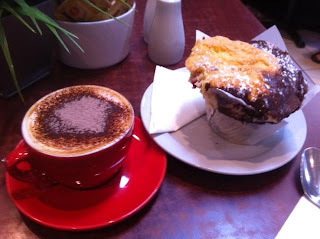 After I set up I walked into town and stopped for lunch at the Green Grocer. It is half cafe and half bicycle shop. I needed to get a replacement bolt for one of my SPD cleats, as seemed to have lost one yesterday. Very friendly shop and got the bolt I needed. After lunch I walked around town. They currently have a rose festival on, so a lot of the parks and gardens have roses in bloom. Tomorrow I'll be heading towards Tuena and it is meant to be grey tomorrow as well. As long as it doesn't rain. I quite like the cloud cover, as it keeps the temperature down.